Posted: Wed 05 Dec 2018, 09:22 Post subject: How do I mount device without displaying file-list? How can I mount a drive without actually having the files displayed in ROX or PCMan or whatever? I prefer to use emelfm2 or doublecmd as my file managers, but they are of no use until the devices are mounted. Mounting means a ROX display which clutters up my desktop. I have to click the drive icon to mount then close the display window. What I think would be ideal would be a Shift-Click or Alt-Click on the existing drive icon, which would mount but not display. A CLI command couched in a script with YAD that I could associate with a custom desktop icon would be acceptable too, as second best. Open a command window and use the MOUNT command??? Posted: Wed 05 Dec 2018, 10:33 Post subject: Re: How do I mount device withot displaying file-list? the easiest hack would be to rename the rox file manager-- then you could still run it, but scripts that opened it when you didnt want them to would be unable. obviously the route of creating a different mount tool would also work. There are right click options menu for the listed drives. Try setting the drive to mount partition at boot. That should just have it already mounted when Puppy boots. See if you can change file manager to what you want it to be. Even if the name of the file manager is not listed in the drop down list. It can be typed into the choice. Just need to put the correct info that starts/runs the file manager. Usually the name of the exec file that starts it. /dev/sda1: LABEL="DATA/Boot" UUID="d02d3eb7-4f23-4608-af43-85b7bf7a86bf" TYPE="ext3" PARTUUID="000ec3ee-01"
/dev/sda10: LABEL="HOME" UUID="6234549f-ca89-4081-b590-6a0c1198d91e" TYPE="ext3" PARTUUID="000ec3ee-0a"
/dev/sda11: LABEL="Swap" UUID="8902e9df-6614-4439-97c5-2f222f945fad" TYPE="swap" PARTUUID="000ec3ee-0b"
/dev/sda3: LABEL="64-6.05" UUID="91036e28-b049-4cd7-9d34-3222e9887c0a" SEC_TYPE="ext2" TYPE="ext3" PARTUUID="000ec3ee-03"
/dev/sda5: LABEL="5.5+560" UUID="6b34b50a-60e5-4e2b-bb44-a1690c9756f2" SEC_TYPE="ext2" TYPE="ext3" PARTUUID="000ec3ee-05"
/dev/sda6: LABEL="570" UUID="d808a0fc-6e9b-4d1a-b333-d546e25eb1f1" SEC_TYPE="ext2" TYPE="ext3" PARTUUID="000ec3ee-06"
/dev/sda7: LABEL="571" UUID="aaa36ae9-5da1-4736-ad4f-13cc1b7d7b42" SEC_TYPE="ext2" TYPE="ext3" PARTUUID="000ec3ee-07"
/dev/sda8: LABEL="5287" UUID="2243277a-13a0-4930-9d0d-6102f8ea1db4" SEC_TYPE="ext2" TYPE="ext3" PARTUUID="000ec3ee-08"
/dev/sda9: LABEL="606efi" UUID="253d4d4c-0267-41ed-bbfa-6a04704d34ba" SEC_TYPE="ext2" TYPE="ext3" PARTUUID="000ec3ee-09"
/dev/sdb1: LABEL="TEST" UUID="2e5e441b-4c52-4865-96b8-5bcb4c924f3f" TYPE="ext3" PARTUUID="00087457-01"
/dev/sdc1: LABEL="SeaDesk-1" UUID="190eb203-07ac-490e-aa0f-d10419ca91bc" TYPE="ext3" PARTLABEL="Seagate-1" PARTUUID="531048e8-347b-4b54-9b1d-671dc5718241"
/dev/sdc2: LABEL="SeaDesk-2" UUID="6d394fd7-aad2-4e20-90a9-c3ddcf07cc3e" TYPE="ext3" PARTLABEL="Seagate-2" PARTUUID="68a52708-806b-4141-bf9f-03d878b80bd3"
/dev/sdc3: LABEL="SWAP" UUID="e7e241e2-672d-4a67-900f-86e5b968d320" TYPE="swap" PARTUUID="a4a08ab9-4330-4284-a62b-31d6f47dbec3"
The above is my auto-mount script for Precise 571, Lucid 5287, and Racy 5.5. Once you've created the script, you then need to make it executable, so it shows up green, as opposed to black. In Rox, it's rt-clk->Properties, then tick all 3 checkboxes in the 'Exec' column down the bottom, and hit 'Refresh' at the bottom when you're done. You'll need to re-boot for this to take effect, and for the config changes to be written to your save. I believe this is in effect what modern pMount does when you hit the 'Refresh' button after selecting changes. If that all looks like too much hard work, there's always good old Startmount, created nearly a decade ago by Micko and tasmod. It works very well, too. Whichever you choose, you can then start your chosen FM, secure in the knowledge that Rox won't pop-up and spoil the party! Good idea.....if it were possible. But in every version of the Default Applications Chooser that I've ever seen, the file-manager itself is one category that never puts in an appearance, unfortunately. Personally, if it were me, I'd simply edit /usr/local/bin/defaultfilemanager to point to the exec for whatever FM I wanted to use. Thanks for your response, guys. I have settled on Mike Walsh's but have not tried it yet, Thanks again. Now when I click on a desktop drive icon it mounts and opens pcmanfm showing the contents. Booted into my 'oldest' Puppy on this computer -Slacko 5.7 (albeit substantially modified). As bigpup suggested, Menu>Setup>Default Application Chooser had a section for selecting the default File-manager. I hunted the actual application down. It's /usr/sbin/puppyapps, a bash-script. Opening it in geany revealed that zigbert last modified it in 2015. [If my flaky memory serves, about that time the ability to select the default terminal was added and there was a lot of discussion about using File-managers other than rox as default]. So, perhaps if you're using a pre-2015 Puppy, its Default Application Chooser doesn't have that capacity. At any rate, attached is the puppyapps script from 'my' Slacko 5.7. Rename your current version [perhaps to puppyapps-old], remove the false '.gz' from the attached and drop it in to /usr/sbin. If it works, great. If not, it should't be hard to revert. Mm. Curious. Very much so, in fact. My standard Default Applications Chooser in 570 is 0.8.6, OK? As you see.....no 'file manager' selector, right? Even in /usr/local/bin, where all the 'default' entries live, it jumps straight from 'defaultemail' to 'defaulthandler'. 'Defaultfilemanager' doesn't, in fact, exist.....so I can't quite see how it can be 'set'! Perhaps I need to track down the 'defaultfilemanager' entry from a more recent Pup, drop it in, and see what happens, like. Not fussed about it, but I am getting dead curious now! Well, my Slacko is actually 5.7.1, probably with a kernel different than that which came in the ISO but using a SaveFolder which goes back a couple of years. Examining the applications I installed the only one I thought might have altered the puppyapps file was vicmz's openboxplus 6.2. But decompressing the pet I have in storage revealed that it did not contain a puppyapps file in /usr/sbin. I don't currently have the original Slacko 5.7 ISO. So perhaps it's puppyapps file is different from that in Slacko 5.7.1. Do you have that desktop on your system? If not, does creating one help? A-ha. Light begins to dawn. I've got my own install of Sailor's 571, like you. I still don't use it quite as much as I do the original, although I've been having something of a 'pruning' session in recent days. I've had too many Pups (and 'alternate' distros) on here in various stages of 'usability'; but to cut a long story short, I've got it from 17 down to an even dozen...!! 571 is still with me, so.....I'll boot in later on and see what I can find. Chooser is a prog I have never used. Looked in when bigpup suggested I do but saw no FM. I am using tahr-6.0.6 with Chooser version 0.9. Looked just now ...see screenshot. The only thing I changed from the virgin was the HTML editor. 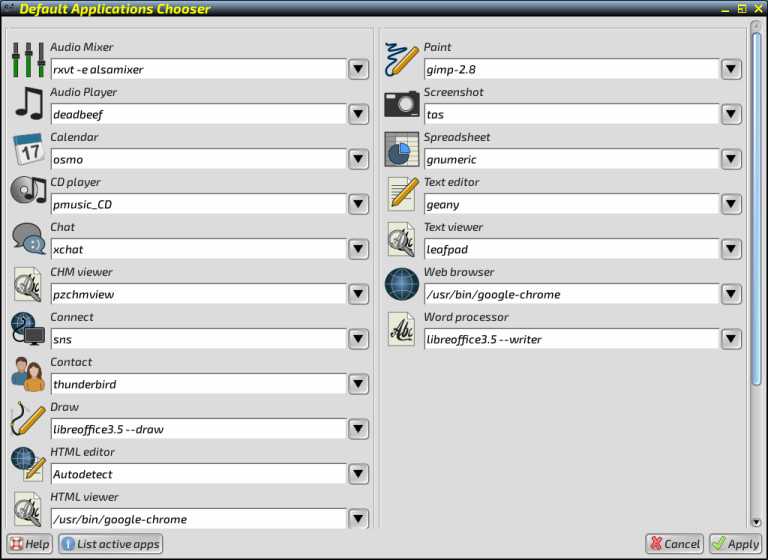 IIRC, Tahrpup 6.0.6 has two 'chooser' applications. Both appeared on the Setup Submenu. One was named Default Applications, the other PuppyApps Default Applications Chooser. One may have been 'hidden'. You can un-hide it via Menu>Utility>PupMenuEdit Menu Editor, [not to be confused with Menu>Utility>PupMenu Launcher & Editor]. Click the Show/Hide panel. See if the one you didn't use has a File-Manager option. 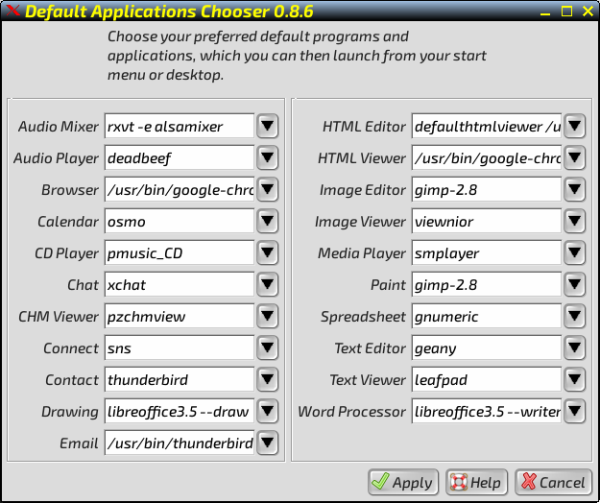 Both Default Applications and PuppyApps Default Applications Chooser appear on the Setup Submenu, but as Mike Walsh reported, a FM does not appear in either.